Improve factory and warehouse safety, as well as increasing visibility of vehicles by using our orange reflective tape. Improve factory and warehouse safety, as well as increasing visibility of vehicles by using our reflective hazard tapes. Our reflective tapes go beyond just the factory environment. They can be found throughout the world, performing low light and ‘lights out’ accident prevention activities across numerous sectors. 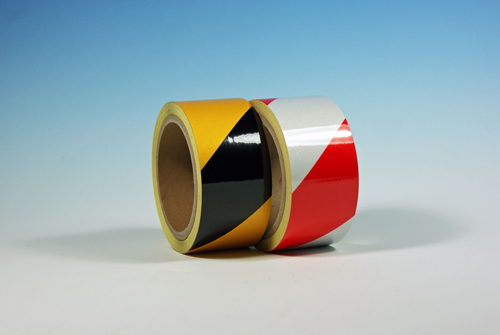 This tape is coated with a permanent adhesive coating, which allows for a long term bond, and with it not being water based, it will not break down under testing environmental conditions. A paper backing liner is applied to protect the PSA (pressure sensitive adhesive ) prior to application. To reduce accidents and save lives. Improve safety and increase visibility of vehicles. Reduce accidents meaning less downtime and decreased repair costs. Protects your company against potential legal action related to third party safety.